My aim is to provide a convenient and friendly service to those who would like an easy way of getting your faulty items repaired. I am based close to the Northampton / Warwickshire / Leicestershire borders only 5 miles from the M1 / M6 / M69. or directly by email using my email address "vintagewirelessrescue@yahoo.co.uk"
or just phone me anytime on 07840 492564 and we can talk about your problem. The process is easy. First contact me using the form below or as above with information as to the make , model number , and description of your fault. From this I may be able to give you an idea of what the problem is likely to be and try to provide a basic idea as to a quote. If you are happy with the quote you receive then all you have to do is send me the item to me and I will endeavour to provide you with a final complete cost of repairs and return. Once repaired an invoice will be sent, when payment is received/cleared the item will be returned to you normally via Royal Mail Special Delivery. I have for more than 45 years enjoyed repairing old radio's that have been discarded by their previous owner as beyond repair or which my now have spares parts no longer available. I have brought them back to life and enjoyed its previous sounds. Vintage product repairs to both valve and transistor pieces will be undertaken to as near to the original manufacturers specification as possible. As products spares are generally only available for 8 to 10 years after release, this means some items may have to be hand made and some circuit modification may be required. This will mean that the unit will not be as original as I would like but will still be as close as possible to the manufacturers released product. A lot of radios produced in the UK in the 60s (Roberts/Hacker/HMV/Ferguson and many many more) used a range of germanium transistors that have an age related issue (look on the web for AF117 transistor issues) for these I have a european germanium transistor that can overcome this problem and do not the same internal issue. Cosmetic repairs are more difficult to achieve but should look as good as possible dependant upon the original conditions of the product. All repairs/modifications will be done to the highest standard possible and fully safety tested. I am now able to add Bluetooth receiving option to some radios!! Currently Bush DAC90A/DAC10 and others are up and running with good reviews and excited users. The add-on is clean and without major rework, uses the original sound output circuit only 2 small holes are drilled into chassis to enable the addition and is hidden from view even with the back removed. Play BBC IPlayer or Radio service or even stored music from your phone/PC or Tablet though the updated radio and enjoy the vibrant Valve sound. I have had vast experience in repairing prestige items of electronics not only of the latest Design but also from the early 20th century. I have been tasked on many occasions with repairing , testing and checking all sorts of units from the latest plasma TVs to videos and radios belonging to many well known names where quality and function really matters. I have a vast collection of Service Manuals, technical Data books and even spare parts dating back to the Crystal “Cats Whisker” receiver days. I have been collecting since the early 1960’s when I first started working in the t trade and never disposed of anything I liked and thought I could repair or make use of. The Photos used on this website are of my stock which include units I have repaired for people in the past. 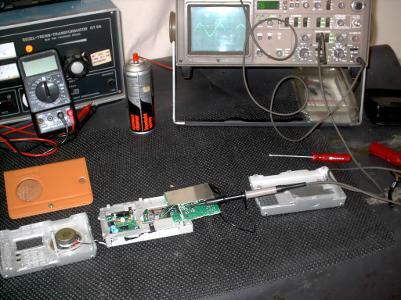 A Grundig "Porsche" Designed Radio on the repair bench prior to assembly after a tuner fault has been repaired. This radio had been purchased in America and NO repair agent would look at it.